All are welcome to join us for the latest talk in our Arts and Humanities Book Talk series on Monday, October 10 at 4:30 pm in the Sterling Memorial Library Lecture Hall. Refreshments will be served before the lecture in the Memorabilia Room. 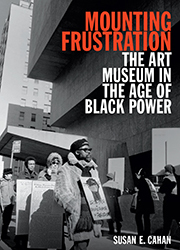 In Mounting Frustration Susan E. Cahan investigates the strategies African American artists and museum professionals employed as they wrangled over access to and the direction of New York City's elite museums. Drawing on numerous interviews with artists and analyses of internal museum documents, Cahan gives a detailed and at times surprising picture of the institutional and social forces that both drove and inhibited racial justice in New York's museums. Cahan focuses on high-profile and wildly contested exhibitions that attempted to integrate African American culture and art into museums, each of which ignited debate, dissension, and protest. In addressing the racial politics of New York's art world, Cahan shows how aesthetic ideas reflected the underlying structural racism and inequalities that African American artists faced. These inequalities are still felt in America's museums, as many fundamental racial hierarchies remain intact: art by people of color is still often shown in marginal spaces; one-person exhibitions are the preferred method of showing the work of minority artists, as they provide curators a way to avoid engaging with the problems of complicated, interlocking histories; and whiteness is still often viewed as the norm. The ongoing process of integrating museums, Cahan demonstrates, is far broader than overcoming past exclusions. Susan E. Cahan is Associate Dean and Dean of the Arts in Yale College, the editor of I Remember Heaven: Jim Hodges and Andy Warhol, and the coeditor of Contemporary Art and Multicultural Education. She has directed programs at the New Museum of Contemporary Art, the Museum of Modern Art, and the Peter Norton Family Foundation.